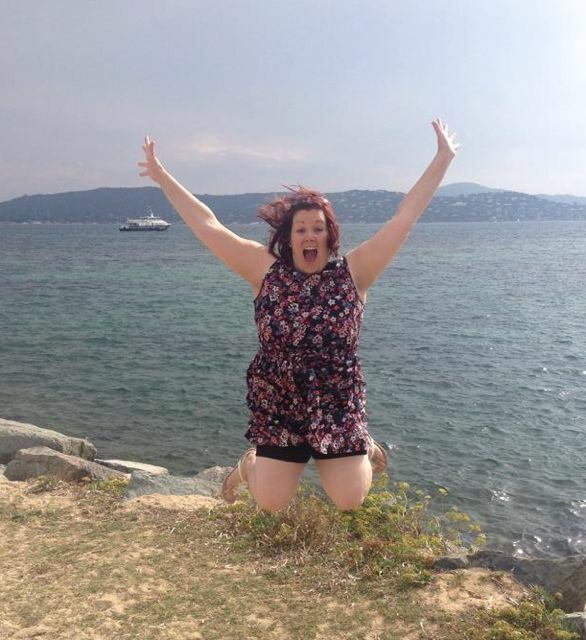 Having recently composed a blog over at my sister site (Stir Up Media) about the importance of taking a holiday as a self-employed business owner, I realised it had been 7 years since I took a proper holiday myself – 7 years!? Stupidly not following my own advice, combined with the fact that I’ve set myself a challenge to travel around the world in 80 stays, I knew it was time to stop hopping to Leeds or London for a mini break and actually take in some real sunshine. 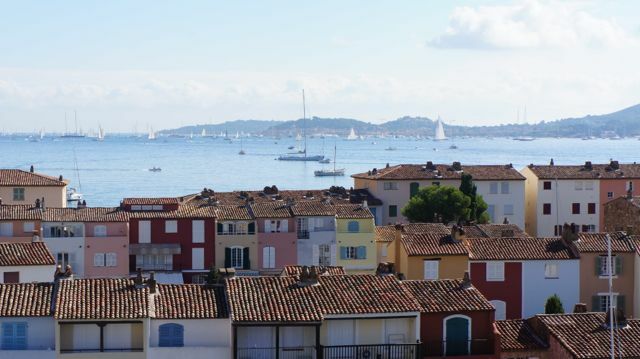 I’d been offered the opportunity to stay in a French villa owned by a family friend and leapt at the chance to re-explore the French Riviera, a beloved holiday destination of mine 14 or so years ago. I had studied A Level French and went there to practice the language of lovers…only to meet a group of German tourists, finding out that my true calling was in ditching my awfully mumbled French vocabulary for the German lingo! So, my Easyjet seat with extra leg room and Speedy Boarding was booked and I flew from London Luton to Nice, where myself & my traveling companion collected a suitably French hire car, ready for a sunshine-filled adventure. Stopping the use of technology was also on the agenda, I went “cold turkey” and thoroughly enjoyed no distractions. I read two books from cover to cover and enjoyed lazy mornings, late nights, exploring old French villages and walks on new beaches. If you need a book recommendation, I can’t rave enough about “Gone Girl” by Gillian Flynn and also “The Suitcase Entrepreneur” by Natalie Sisson for the more adventurous and travel-hungry business owners! 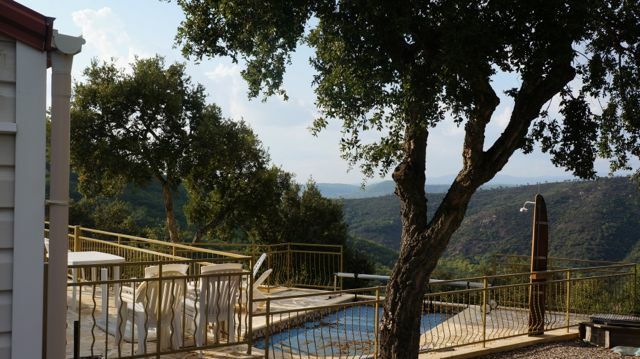 The villa itself was a few miles out of Le Muy, a small market town, situated up in the hills in a place called Domaine Des Canebieres, of which provided a stunning scene below me from the plunge pool and patio deck as I sunbathed in 25*c Autumn warmth. This peaceful and spacious villa had it’s own fully equipped kitchen, a choice of two bedrooms and three bathrooms, as well as a TV with British freeview should it have been required – I “may” have indulged in a few episodes of “Real Housewives of Beverley Hills” – cough, cough. At night, the lights in the villages and towns below looked beautiful and sat on a bench under the trees just up the road from where I was staying, I enjoyed sitting to watch bats darting around, quietly clicking as they went. It was a relaxing holiday from start to end, no matter where I was sat or what I was doing, this was how a break should be. You can’t visit France without pulling up to a roadside Boulangerie and ordering a baguette, freshly baked and warm from the oven to go with your cheese & wine or a slice of gateaux or Millefeuille whilst you’re there… I also enjoyed a round of freshly hatched croissants, some buttery brioche with jam and two versions of a Religiiuex, which can be likened to two large ganache-filled profiteroles, decorated to look like a nun. I enjoyed a chocolate flavoured pastry and also a coffee creme patisserie filled pastry, both from different bakeries on my travels and one equally as delicious as the other. So. 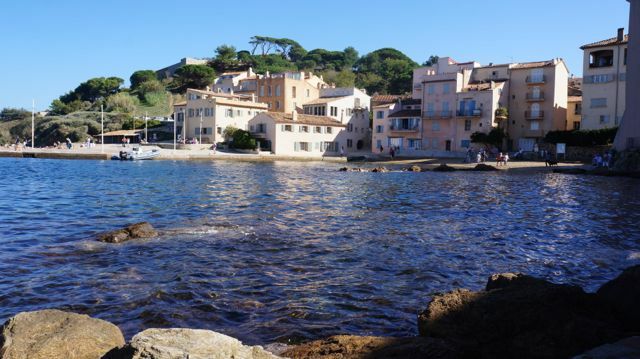 Whilst in this region, I managed to enjoy a little tour of the area and enjoyed some simply stunning scenery from the castle ruins in the old village of Grimaud, the peaceful sunset on the rocks of Sainte Maxime harbour and the extremely steep drive up, around and down into Plan De La Tour, a quaint and hidden French town for the perfect destination off the tourist trail. Without a hire care, there simply wouldn’t be as much exploring, you would be very limited on where you could go, so it’s a must. 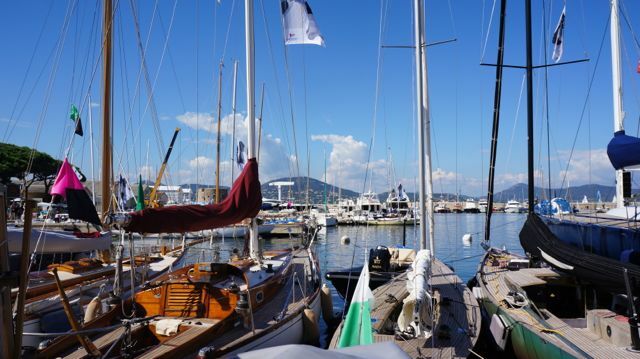 Visiting St. Tropez out of season is actually a great time to take a trip (literally one day left on the boat taxi from Port Grimaud – they stop running on 4th October) and I enjoyed a sun-drenched walk around this stunning place. I had expected to eat out along the port, but for up to €25 for a plate of mozzarella & basil, I decided an ice cream to be much more in my budget! There are two ice cream parlours very close together, one being “Barbarac” with queues out the back door as well as through the front… or there’s the parlour a few doors down with nobody waiting or queuing. Usually I wouldn’t bother to line up, but I felt there was a reason people were going mad for this place and I really wasn’t wrong!! I opted for a scoop of Oreo and a scoop of coffee ice cream and the flavours were intense, it was like tasting a cup of coffee in cold form, just beautiful! 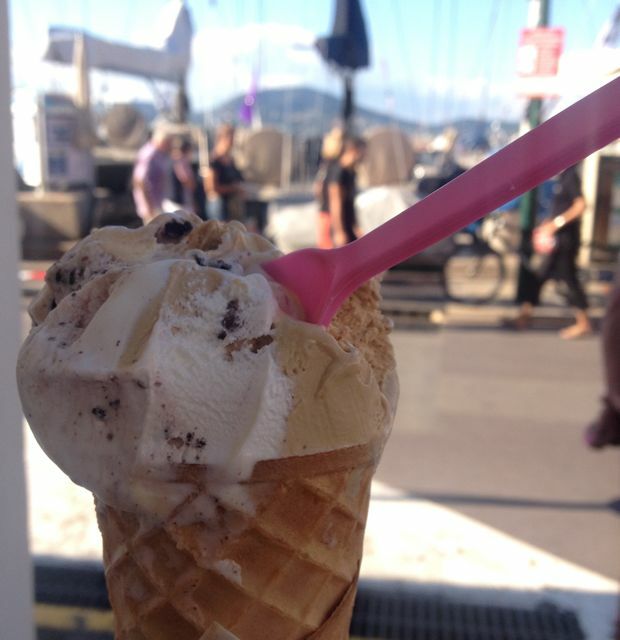 The waffle cone was also crisp and the generous serving kept me going all afternoon – I’m a cheap date (two double-scoop ice creams came to €9) even in the South of France it seems. 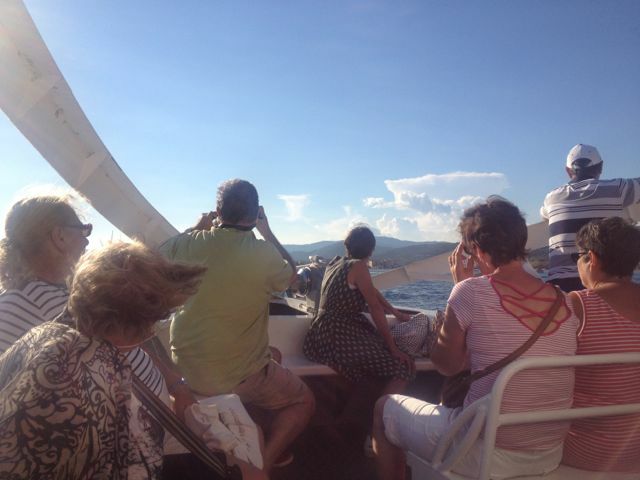 St Tropez from Port Grimaud with Navette-Bateau.com cost just €12 per adult for a return trip. 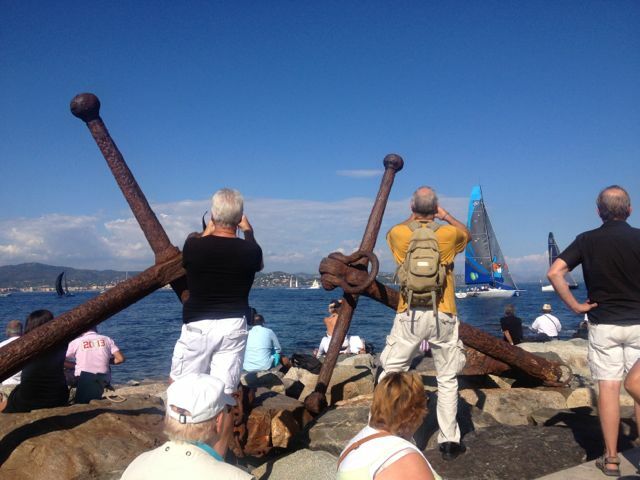 I could have driven there, but a boat trip in the Mediterranean sun is pure heaven, don’t miss out on this breezy journey amongst the luxury yachts and impressive liners. I managed to make use of the local supermarkets (Casino, Carrefour, etc) and enjoy some home cooked meals, even a BBQ with some tasty Toulouse sausages and roasted vegetables. 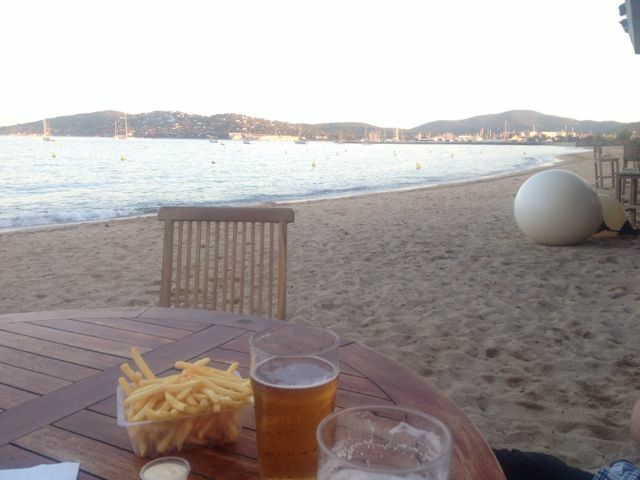 But, it’s not a French coastal holiday without beers & frites on Port Grimaud beach under the palm trees to watch the sunset – just stunning and still so warm from 8pm onwards. Whilst say there one evening, a huge black cloud rolled in behind me and lit the sky with epic sheet lightening and 2 or 3 bolts at a time (no thunder!) so the drive up the windy hills back to the villa was a little scary for a girl who’s petrified of thunderstorms! 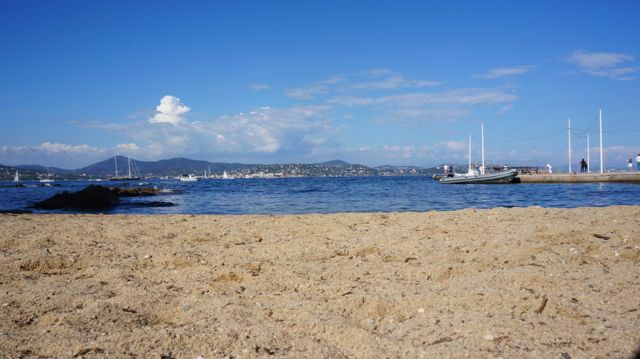 After the 29th September, parking in Port Grimaud is free, so I ended up parking here a fair bit for my beach fix. 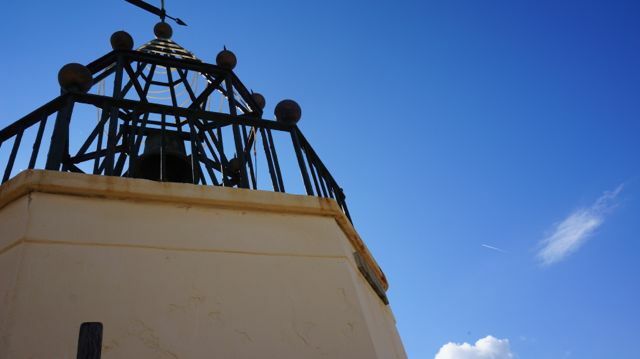 The beach here is beautiful, the port itself is stunning and for just €1 per person you can climb to the top of the church within the harbour and enjoy the best views for miles. 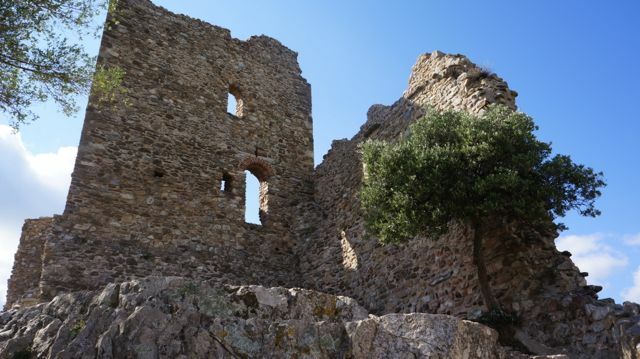 From here I spotted a castle in the hills (La Garde Freinet) and later that same day we drove, following our noses to find it for exploration – it boasted an amazing view of the sea and ports, making it well worth the random road trip to hunt it down. Whilst visiting the Côte d’Azur, I managed to hunt down a tranquil outdoor spa, surrounded by palm trees, complete with panoramic sea views – Spa Sarome is well worth a visit for some much needed relaxation. €17 gains you access to this beachside paradise for an hour, allowing you to indulge in their secluded hot tub, sauna, Hamam and heated plunge pool. 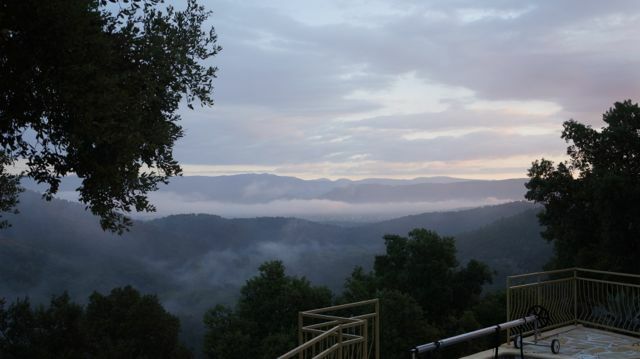 It’s the perfect getaway from a busy beach in the height of summer. 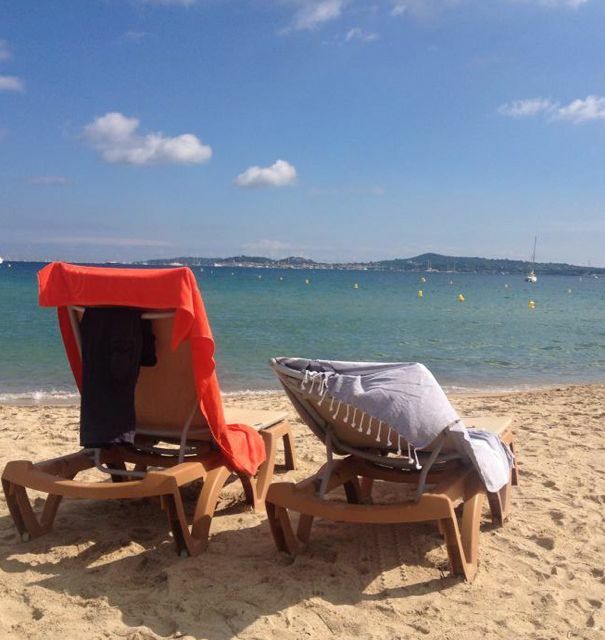 I will never tire of the beautiful & scenic coastal drive between Le Muy and Grimaud, the beaches of Sainte Maxime twinkling as the sun hits the water, it’s stunning and inviting me to stay… so very tempting! Brioche, Millefeuille (oh my goodness!!! 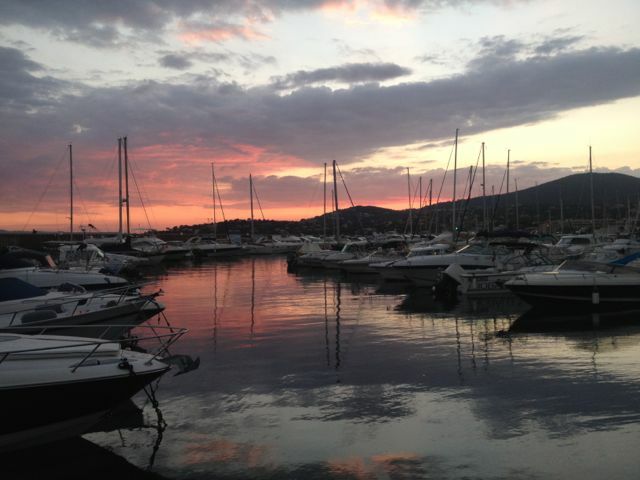 ), Bon Mamon puddings & tart selections or Gu desserts that you can’t get here in the UK, Lauderee in St Tropez harbour are all treats you can expect to find here. I also found a supermarket one day with amazing Pain du Chocolat freshly baked and stacked on the shelves – I couldn’t wait to eat them for breakfast the next day as planned and had to nibble on one in the car as the smell was très irresistible. 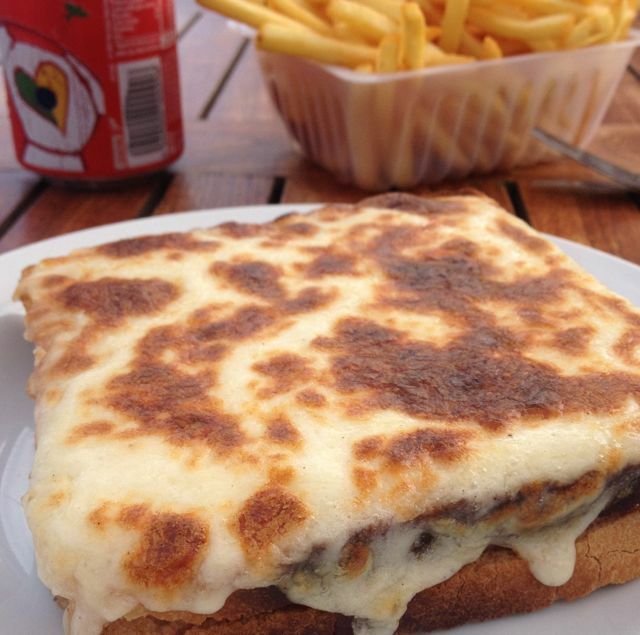 I got to day 5 and craved a Croque Monsieur – how could I forget to sample a French version of one of my most favourite sandwiches?! 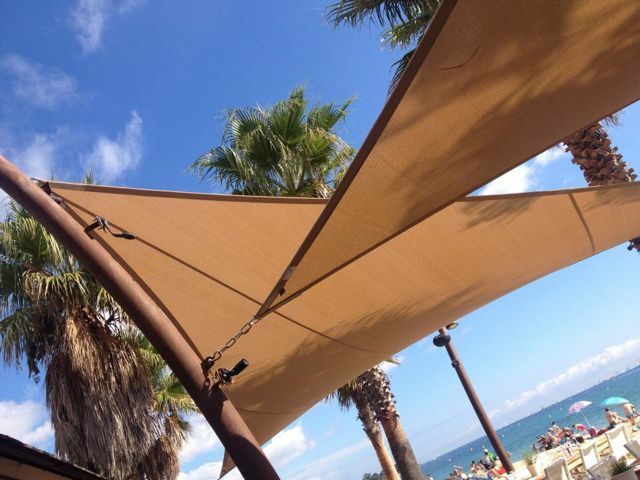 I enjoyed this on the beach with a beer watching the sunset – heavenly. Traditional baguettes and cheese for a beach picnic did the job during the daytime – delicious and warm bread fresh from the roadside Boulangerie en route. 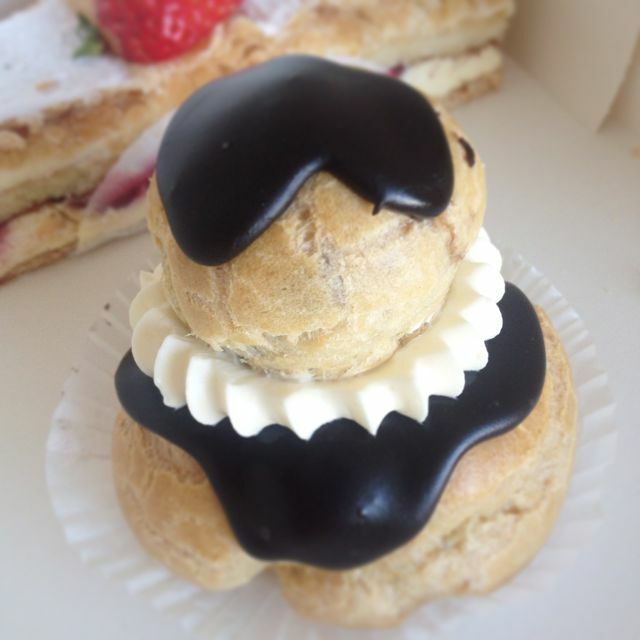 If you get a chance, you must also try a Melieneux (a meringue ball with chocolate ganache) and a coffee Religiuex – delicious patisserie, the ones I enjoyed the most whilst here. The road signs are hilarious – as you leave a town, there’s just the name and a giant Red Cross through it to show that you’ve left – amused me at the “abruptness” of the signage, I ended up shouting the names of the towns as we drove out of them as a fun game. Aqualand is close to Le Muy, towards Sainte Maxime, but it was closed at this time of year – earlier in the year and this could be a fun place to spend a few hours on the slides and wave machines. Supermarkets and shops seem to be closed on Sundays – noted for next time, be a little more organised when needing food for meals!